This is where it all started. In the late 1500's, a channel was dug to supply water to a factory. Workmen unearthed frescos which turned out to be the interior of houses near the amphitheater. In the mid-1700's, when Herculaneum was discovered, the significance of the frescos began to be understood, and the excavation of Pompeii began. The Amphitheater was uncovered in the early 1800's. It would have seated 20,000 people. The outer wall would have been painted with scenes of hunting and contests. Stone rings held poles to support linen tarps, to provide shade. The entertainment included sporting events and gladitorial contests, and was widely advertised on posters in town. Apparently the Pompeiians had their own breed of football hooligans as well, as sporting events were banned from the arena for the years 59-62, due to a fight between fans getting out of hand and leading to many deaths and injuries. 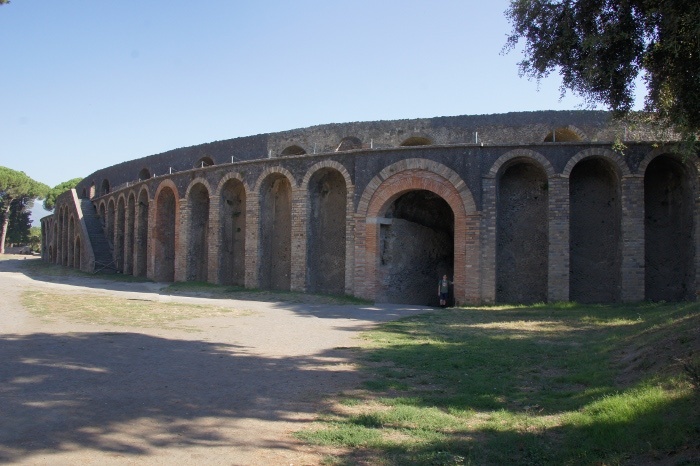 The ban was lifted following the earthquake in 62, which partially destroyed the amphitheater. When it was repaired, games were allowed to resume. Keyhole view of part of the exterior wall of the Amphitheater. 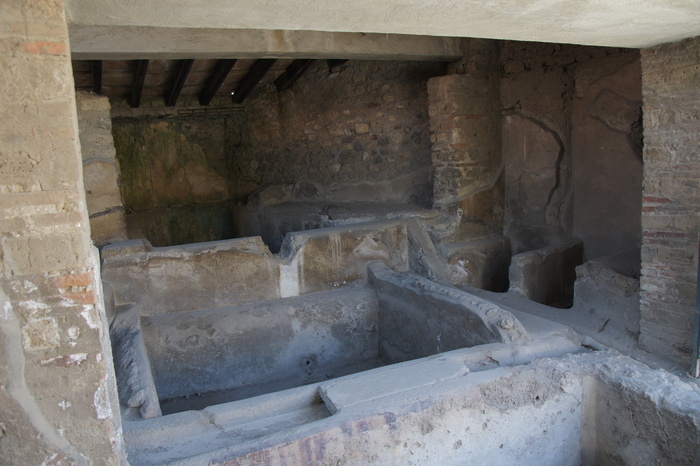 Unlike Herculaneum, human remains were found within the city of Pompeii. Most are found only as hollow spaces in the ash, left by the ash filling in around the bodies, and then the bodies themselves slowly decaying away. In 1863, a method was developed to fill the hollows with plaster, creating an impression of the negative left by the ash. About 400 such impressions have been found buried in the 10 feet of ash that fell on the first day of the eruption. 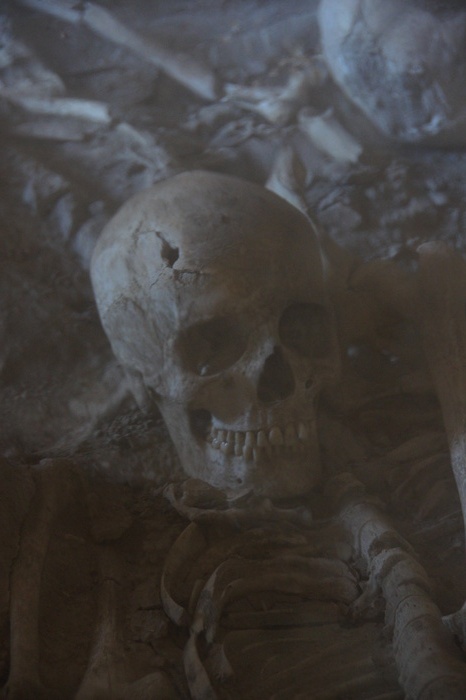 An additional 650 have been found in the upper layers: people that survived the first day of the eruption, but were killed by the same pyroclastic flows that buried Herculaneum during the night and second day. 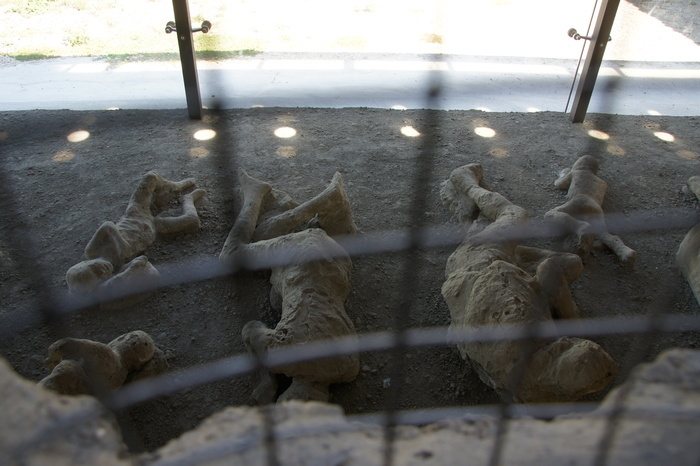 Of Pompeii's 20,000 residents, about 2000 are thought to have died in the eruption. The remainder escaped in the few hours between the first signs of volcanic activity and the rain of ash that buried the city. This group, 13 in total, were found in the Garden of the Fugitives. 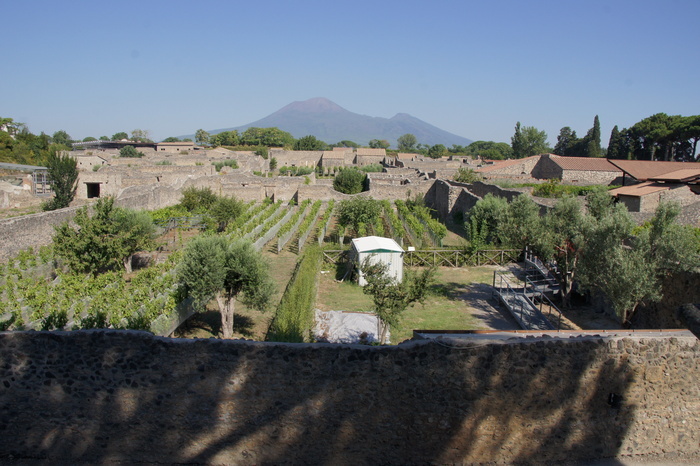 Recently, the curators of the site have decided to again let the Garden become a vineyard, which produces the Villa dei Misteri wine. 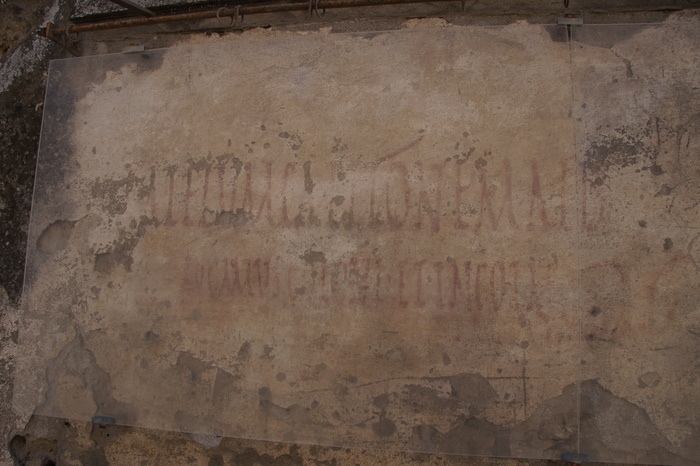 The walls of Pompeii and Herculaneum have thousands of inscriptions. Many are political - encouraging citizens to vote for one candidate or another. There are over 3000 such signs in the city, and most of these are in red paint, so probably that's what this one is. There are also several hundred examples of graffiti - jokes, lewd remarks, exchanges of insults, expressions of love, and even one which reads, Satura was here on September 3rd. In short, exactly what you will find on any isolated city wall or barroom toilet stall today. A collected translation of the graffiti found in Pompeii is found here, but be aware that (like modern graffiti) much of the content is adult/NSFW. 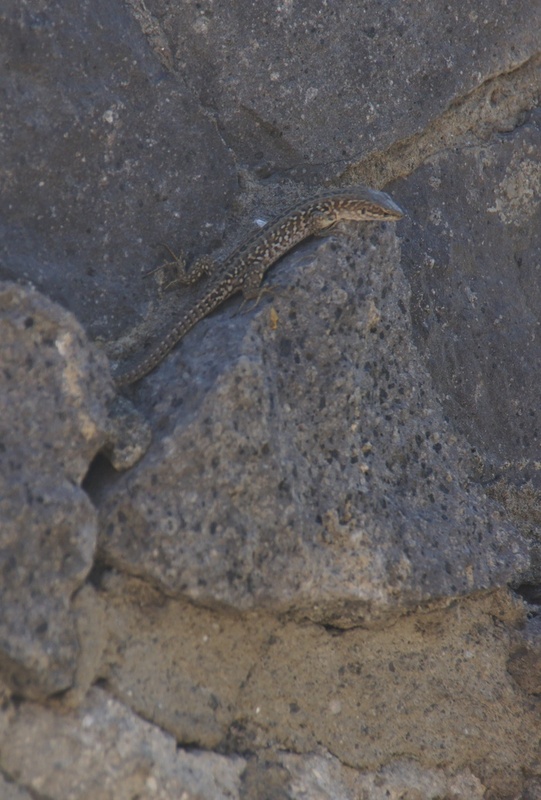 Although there's nothing to stop you from climbing on the ancient stones, we mostly kept a respectful distance. 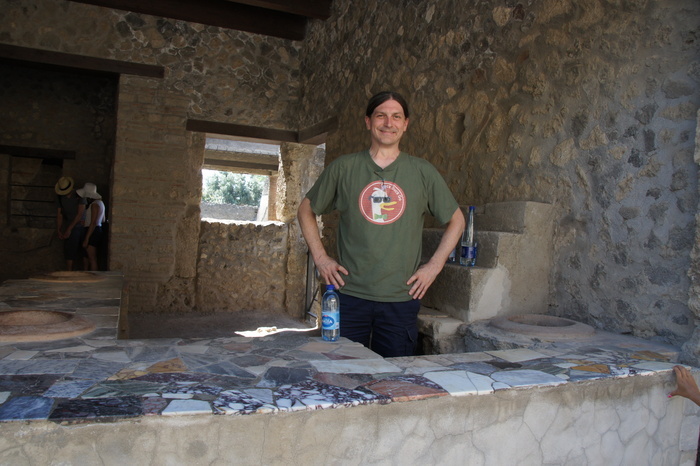 Eric did allow himself a brief moment to bartend in one of Pompeii's many thermopolia. Most had counters with a similar pattern of brightly-colored pieces of marble. 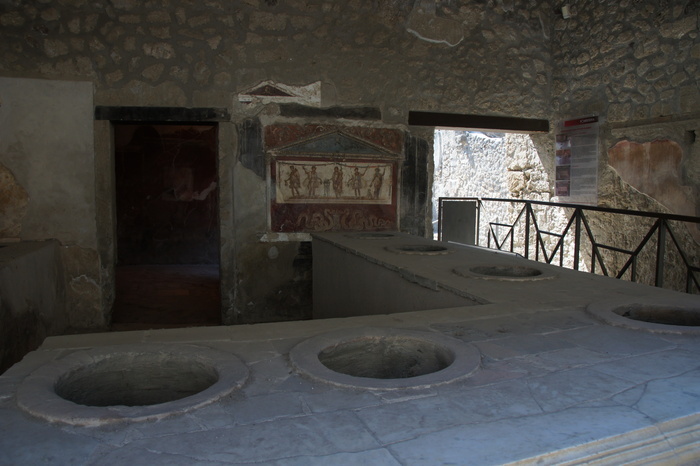 Residents of Pompeii would have eaten lunch at such an establishment, which would fill the large clay pots with hot food. A portion of ordinary wine was approximately 50 cents on the local economy. The thermopolium of Vetutius Placidus includes a lararium, or painting devoted to the gods of the house. This one consists of a genius loci or spirit of the house in the center, offering a sacrafice on a small table. To one side is Mercury, representing commerce, and Baccus (with a cat), representing wine. 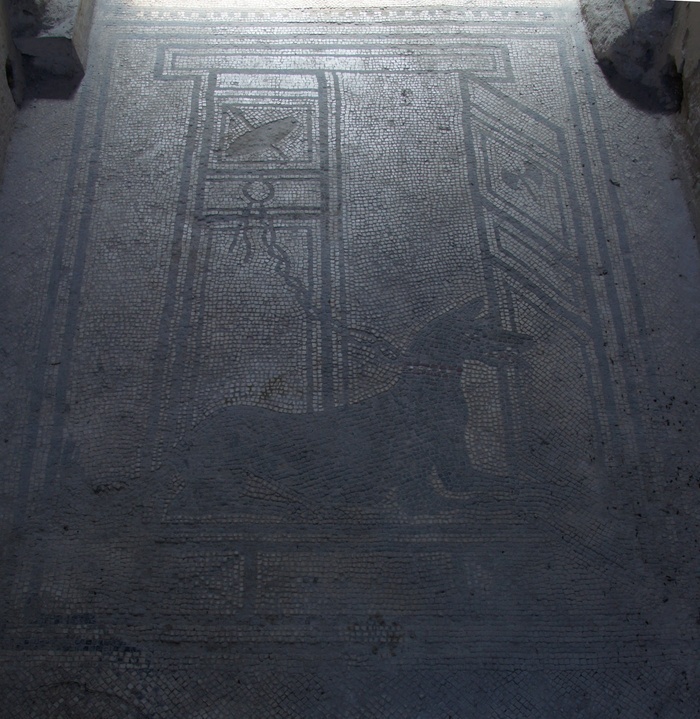 This mosaic of a guard dog marks the entrance to the House of Paquius Proculus. It was closed during our visit, but reportedly the entire floor is covered in mosaics of animals. This was the Fullonica of Stephanus - Stephan's Laundry. Clothes were washed by first being trampled in water (to remove the heavy dirt), then trampled again in vats of degreasing agents, such as soda or urine. Urine was collected for the purpose by having urinals attached which passerby could use. They were then treated with clay to reduce the stiffness introduced by the urine, and rinsed (hopefully very thoroughly). Afterwards they were placed on the roof to dry, and then carded (run between moving surfaces to break tangles in the fabric, thus softening it), and finally pressed. 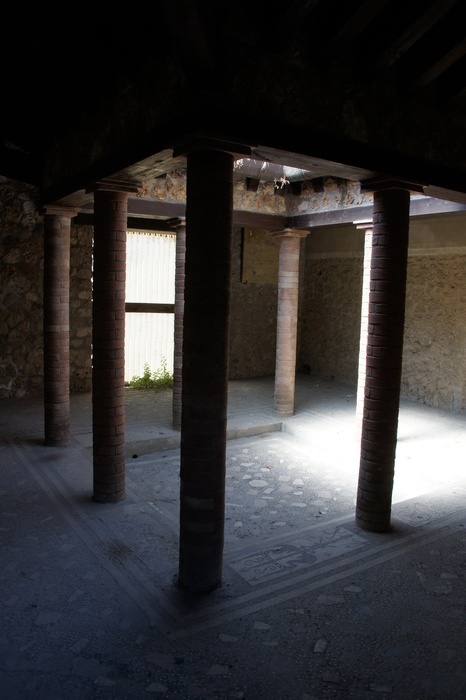 An impluvium in the House of Menander with (reconstructed) brick columns, which probably would have been covered in plaster and painted. I imagine this would have been a peaceful room to sit and watch the raindrops fall. A number of skeletons were found in the house: an older man and a young woman on the ground floor, and several others in the upper levels. This skull seems to have its full set of teeth, including wisdom teeth, so presumably it belonged to one of the adults. 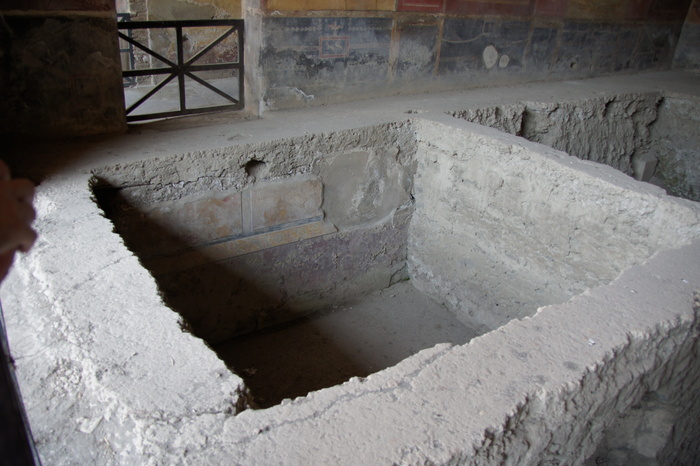 Another odd feature of the House of Menander is an excavation below the floor, revealing another house below it. The painting style is consistent with the First Style, popular in 200 - 80 BC. Probably this house was buried in one of the landslides that hit the city in the centuries before the eruption. The House of Menander was built on top of the ruins of the former house, using the buried walls of the previous house as a foundation. Probably, a number of Pompeiian houses have similar layers below. 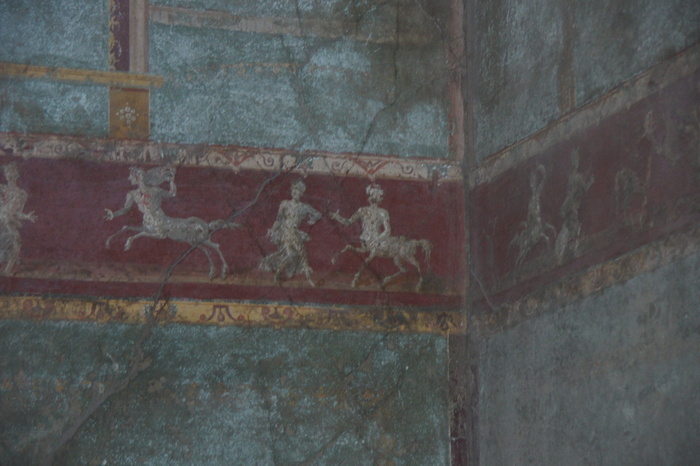 Detail from the decoration in one of the rooms in the House of Menander, with centaurs. 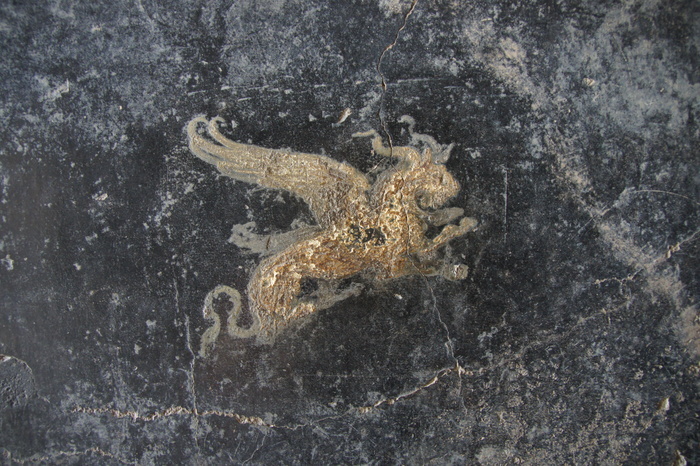 Another detail from a fresco in the House of Menander. 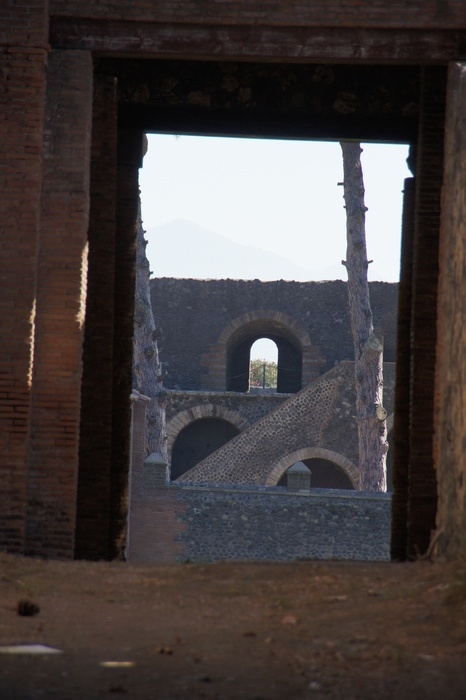 *For anyone trying to follow the route: The ruins of Pompeii are accessible either from the main Pompeii rail station (Circumvesuviana Napoli-Poggiomarino route), which is to the northeast of the ruins, or the Villa dei Misteri station (Circumvesuviana Napoli-Sorrento route), which is to the west of the ruins.